The BKSA level 2 is a two day course which builds on the knowledge from the one day BKSA level 1 kitesurfing course. We recap a few of the techniques learnt on day one and then we introduce the board. The aim of the level 2 course is to instil confidence, perfect kite control and get you up and riding. Hunstanton Watersports offer a wide range of kitesurf lessons from absolute beginner to intermediate / advanced – all under the supervision of BKSA approved kitesurf instructors. 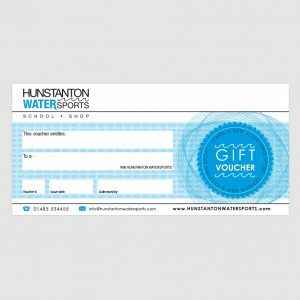 Browse our range of Kitesurf Gift Voucher here – and give the gift of kitesurfing to your friends and family.